Beekeeping is a traditional activity benefiting from modern technology and enlightened attitudes. Environmentally important, profitable, fascinating and enjoyable, beekeeping is a hobby that can more than pay for itself. We no longer keep our bees in straw or reed ‘skeps’, but instead use efficient hives enabling careful and accurate management of the occupants. The strains of bees have also changed through the years and although there is a strong case in favour of the English indigenous bee. We utilise modern Integrated Pest Management programmes to help maintain the health, well-being and productivity of our bees. Today’s beekeepers also benefit from a friendly and freely-given exchange of advice and experience, from beekeepers both in this country and throughout the world. Could you handle 50,000 bees? It sounds a formidable challenge and to a potential beekeeper, perhaps even off-putting, but a normal healthy hive in mid-summer could well contain as many bees as this. And competently handled, most bees should remain docile and well mannered. If you would like to handle bees for yourself, before committing to actually becoming a beekeeper, several beekeepers within our area would be happy to introduce you to bees, hives and honey taking. 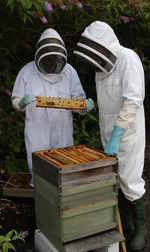 In addition we offer a 'taster session' for potential beekeepers in the autumn. Can I do it? How do I start? Can anyone do it? The simple answer is YES, providing you have enthusiasm and a respect for the bees themselves. Within the 200+ beekeepers in the Chichester area are professionals, busy businessmen and women, youngsters, retired people, couples and people just like you. Getting started is not necessarily a high-cost exercise and there is generally second-hand equipment available, especially from the spring time auctions. And at certain times of the year, colonies of bees can be obtained free of charge – by collecting or being given a swarm. Our swarm collectors may be able to help in this respect by contacting you if a swarm becomes available. It is vital that you learn at least the basics of beekeeping before you get bees and Chichester Beekeepers offers an 8 week course ‘An Introduction to Basic Beekeeping’ starting in early March each year. Keeping bees is just like keeping any other kind of animal, in that they need regular care and attention and they need an understanding of their needs. Beekeeping is time-consuming and disappointment may follow if you think that you can just put a hive in the garden and all will be well. The training course consists of 8 sessions, comprising of a combination of evening classes and half-day practical sessions at beehives. Lecturers are experienced and knowledgeable beekeepers and each session is supported by detailed course notes. 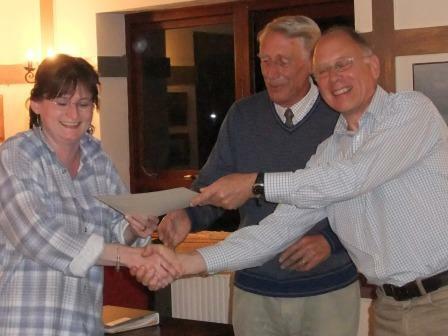 The course fee includes a text book on beekeeping, membership of West Sussex Beekeepers' Association and the British Beekeepers' Association, third party liability insurance, a monthly newsletter and monthly meetings of Chichester Beekeepers. The current course is taking place and this is fully subscribed. To find out more or add your name to the list for the next course click here. In any event, do come along to one of our meetings to learn out more about beekeeping. 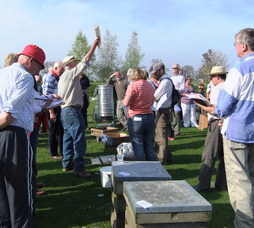 In addition West Sussex Beekeepers arrange Saturday afternoon or evening meetings on an ad hoc basis. These are held at the apiaries of experienced beekeepers or at a central location and demonstrations will be of interest to established beekeepers already at an intermediate level. Monthly evening meetings are held in the Fishbourne Centre, near Chichester, when specific and topical beekeeping subjects are addressed and advice is freely available from more experienced beekeepers. Check the Events page for details of meeting topics and dates. As a beginner, it is very attractive to be given a swarm of bees. You have a colony for nothing. BUT you will not know anything about them. They may be spiteful, they may be from swarming stock, they may have disease, they may have an old queen or it may be too late in the season for them to do any good. On the other hand, they may be splendid and develop into a first class colony. You can’t tell! You can be more sure if you purchase a colony or a nucleus of bees from an established beekeeper, who has already treated the bees against parasites, who can tell you the age of the queen and something about the nature of the bees themselves. Colonies of bees are offered for sale at local bee auctions and these will have been inspected for disease before the sale. 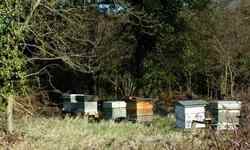 Colonies are advertised for sale throughout the country, by beekeepers who are retiring or by enterprises who rear colonies for sale. There may be colonies for sale right now in the Chichester area (details in the monthly Newsletter). Buying locally often means the bees will be delivered! It is not necessary to own huge areas of land to site your bees. 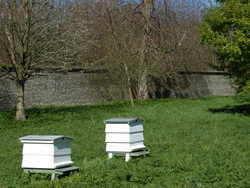 In many cases, one or two hives can be kept in even a modest sized garden. If this is not possible or desirable, many farmers will welcome properly kept hives on their land, as the bees' presence will be of benefit to their crop production. You would probably take care not to locate a hive close to a footpath or road for example, or close to a children’s playground and putting one close to the backdoor is not recommended. Neighbours need special consideration and you will not win friends if they are scared of bees or wasps (and many people do not know the difference) and do not share your interest. Allotments may seem ideal sites, but not all allotment holders would agree! Realistically, putting a hive in the average small garden can lead to inconvenience to the owners, their children, their pets and their neighbours. Bees cannot be trained to ignore any of them, even though they generally do, but there are times when you will upset your bees by carrying out regular inspections, when they swarm or when you take honey and they may become ‘slightly upset’ for a day or two. The edge of woodland or farmland borders are ideal, in little corners that are not cultivated and where grazing animals cannot knock the hives over. Locations in large areas of corn or potatoes are not of great interest as these crops do not produce nectar available to bees. Think about the availability of bee friendly flowers. It’s worth talking to farmers and landowners in your area as many are ecologically aware and concerned and will often prove keen to help. Rent has, for many years, been a 1lb jar of honey per hive per year, but you may consider this to be too little in these days of higher costs! This subject is well covered in books available free of charge from the Division’s library and other beekeepers will talk for hours on the subject! The subject will be dealt with in detail during the Training Course. Beekeeping is one of the few hobbies that can pay for itself and once the initial set-up costs have been met, most beekeepers can generally cover their costs during the year. The average honey yield per colony (ie per hive) per year is approx 47lbs and in a really good year, with a strong colony, yield can be as high as 120lbs. Currently, honey sold at the gate is worth around £5.00 per lb, so even after buying jars and lids and producing labels etc, the return is well worthwhile. You will also find that the number of friends you have will increase in the same proportion as the amount of honey you give away! There are, of course, regulations regarding the sale of honey and details are available from the BBKA. 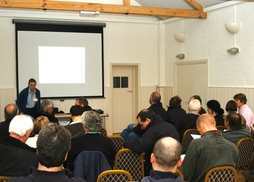 The production of all of the above calls for skills and techniques all well within the capabilities of any beekeeper and Chichester Beekeepers provide training courses and lectures on all aspects of honey and wax preparation. Contact us for more information on bees, beekeeping and details of membership. Honey is extracted from the comb using a centrifugal extractor. These vary in cost, but Chichester Beekeepers have one available to lend to members. Many honey consumers are keen to buy their honey still in the comb. This is called 'cut comb' and calls for a slightly different preparation process by the beekeeper. This is more time-consuming, but the end product commands a much higher selling price.